Keywords are the currency of the web. Without an astute use of highly profitable, niche keyterms your web site pages just won't be found by people who are wanting to buy from you. Without the use of profitable niche keyterms your web pages won't rank well on Search Engines. Your only option is to outsource your traffic generation. Keyterms Are Your Online Business Intelligence! Without a sophisticated market entry strategy developed from keyword intelligence data your online business model has critical and fundamental flaws. Without profitable niche keyterms your Google AdWords and Pay Per Click campaigns won't get your offer before prospects wanting to buy from you. Without an online marketing plan developed from superior keyterm intelligence you are (frankly) wasting your money and your time on the net. Better keyterm intelligence + a better plan = Profit! Use a raft of sophisticated keyterm traffic analysis systems, and our years of online marketing experience to interpret the keyword research data to create unique keyterm intelligence reports for professional webmasters. Find a slew of profitable, niche keyterms that will give you the edge over your competition, and identify niche markets for your products. Analyse your key online competition to give you a range of counter keyterm and web marketing strategies for you to implement. 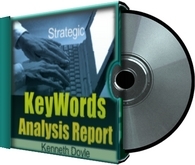 Create an individualized strategic keyword analysis report for you to use with your own web site/s, Google AdWords (or PPC) campaign/s, web article/s content and/ or rss syndication feeds. The VALUE Of This Data Is Superior Marketing Intelligence. Our reports are customized for individual customers. Before we begin any strategic analysis we need information about your online business activities and your objectives. Please complete the form below and we'll communicate with you. Once we've discussed your keyterm intelligence needs with you, and we've agreed to go ahead with the analysis you'll be asked to pay 50% of the appropriate fee into our PayPal account. Your final report and analysis will be made available to you within 72 hours... after you have paid the remainder of the fee into our PayPal account. Tell us about your regional market. I found out about this keyword analysis package from...* ---Select---A: www.FeedYourHungryMind.com B: One of Kenneth Doyle's Qchannels. C: The "Taming the eBeastie" e-reports. D: Other.